George Weitlauf was a mechanical engineer who designed equipment and directed projects for several large companies in the first half of the 20th century. Weitlauf had worked for the Victor Record Company, Camden, New Jersey, and it's subsidary in South America. From there he went to the American Printing House for the Blind in Louisville, Kentucky, to help them manufacture phonograph records for their talking book project. That's where Syd Nathan of King Records found him and lured him to Cincinnati, Ohio. Weitlauf became the Plant Engineer for King Records and built the factory that made Nathan's everything-in-house idea work. After five years of working for King Records, he left to build a record pressing factory for himself. 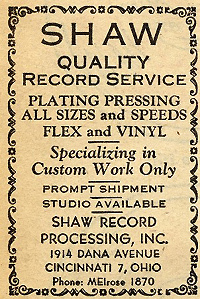 A September 24, 1949 press release announced the opening of Shaw Record Processing on Dana Ave. in Cincinnati, Ohio. Although Weitlauf was the majority partner of the new venture, he needed a name for the company and fellow former King executive, Stephen Shaw, agreed to naming it Shaw. Steve Shaw had been in charge of the plating and metalwork department at King and continued the same responsibilities at the new company that carried his name. When Shaw opened in 1949 there were very few record pressing plants in the United States. The only other one in Cincinnati was King's and at that time they exclusively pressed their own product. Shaw was unique in the midwest and was immediately successful. Shaw's client list grew rapidly. One of their earliest customers was Carl Burkhardt who was just starting his own company, Queen City Records which later became Gateway Records and eventually Rite Records. Early releases on Burkhardt's Kentucky, Top Tunes, Gateway and Big 4 Hits labels all have his Shaw account # 6 in the matrix. Shaw pressed records for a who's who of companies in the early 1950's including Aristocrat, Bullet, Champion, Chance, Checker, Chess, Club 51, Dot, Gennett, JOB, Nashboro, States, Sun, Tennessee,Trumpet, United and Vee-Jay plus many smaller labels like Acme, Cozy, Esta, Excellent, Goldenrod, Mar-Vel, Pearl, Radio Artist, Triple A and Wheeling. Many records pressed by Shaw are now among the most collectible of that era. You'll find Shaw account #72 in the matrix of almost all early Sun releases including all of Elvis Presley's Sun 78's and 45's. Nearly all of the releases on Chicago's legendary Chance label carry Shaw account # 87 in the matrix. 1. Sometimes there is a letter C below the account number. 2. Sometimes there may be an M inside a C near the account number. 3. On the higher account numbers (upper 300's & 400's) there may be a # symbol before the account number. Shaw stopped production early in 1956 but there are many releases by known Shaw accounts that were produced after 1956 that look like Shaw pressings. 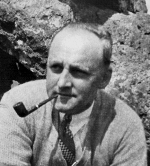 Stephen Shaw resigned from the company at the end of 1955. When the assets were sold in 1956 he purchased all the plating and metal work equipment. There appears to be evidence that he continued to make masters, mothers and stampers for some accounts. Although these pressings were done by other companies, the finished product looked very much like Shaw pressings. This may have continued until about 1959.